It’s finally spring! Gardeners and horticultural therapists are gearing up for the growing season and can’t wait to be outside. At Magee, there is no exception. It is time to gradually remove winter mulches and leaves from your raised beds and garden areas. Adding organic matter, turning over the soil, and incorporating fertilizer is a great way to prepare for the beautiful plants that will be coming our way. Your local Master Gardener office usually has an opportunity to test your soil to see what is happening and what might need to be added. Prune away dead branches of shrubs and trees and deadhead perennials that are peaking out. Roses can be cut back at this time, and you can start feeding them. 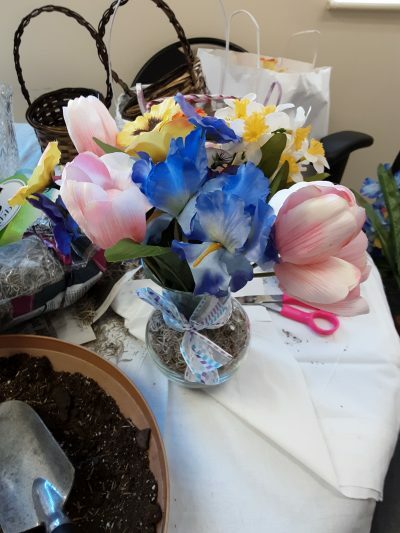 Here at Magee, we are enjoying the spring bulbs (tulips, daffodils, and hyacinths) that are emerging as the soil warms. Patients and volunteers planted these in the fall. Peas and cool vegetables are being planted. This includes onions, beets, radishes, lettuce varieties, spinach, and carrots. Pansies and primroses are available now at garden centers to plant and add nice color. Volunteers and patients also have been starting warm vegetable seeds in the greenhouse (eggplant, tomatoes, and peppers.) These will be transplanted a few times before they are put outside in May. Patients have repotted houseplants as they leave the dormancy of winter and start new growth. Ordering for supplies has been an ongoing process since January to get ready for the growing season. The Horticultural Therapy Program just got word that we received a wonderful grant from the Philadelphia Committee of the Garden Club of America! We will be planning an International Garden on the 6th floor Creative Therapy Center and Healing Gardens. Flags of different countries will accent unusual vegetables grown in these areas.